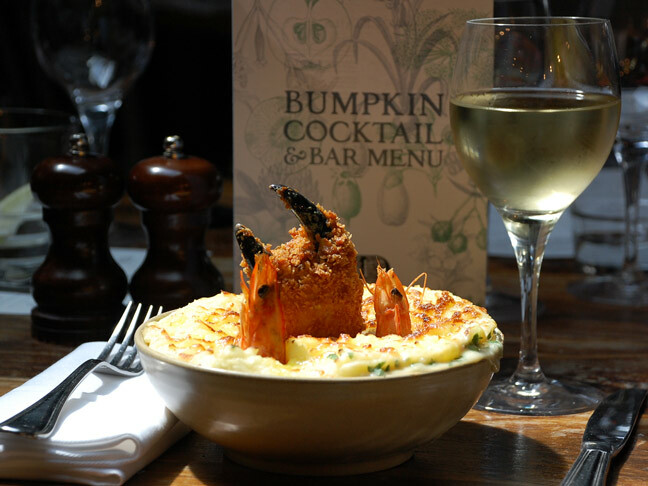 I had never heard of a Fish Pie before I moved to London—and actually, the idea of it doesn't appeal to me—so even though we have it on our Bumpkin menus, it took me a while to try it. But as soon as I did, I was hooked. (No pun intended!) It is both fresh and filling. I love serving my individual fish pies with a crisp Sauvignon Blanc. AND I always make a bit extra, as inevitably everyone wants seconds. My toddler is also a huge fan (especially of the crab claw on top). Step 1: Bring the milk to a boil then add in the smoked haddock. Step 2: Remove from heat and set aside for 20 minutes so that the haddock absorbs the milk. Step 3: Remove the haddock from the milk but do not discard the milk. Step 4: Melt the butter in a large pan. Add in diced shallots and cook slowly until translucent for 3 minutes. Step 5: Add in the flour and mix until a sandy texture is achieved. Step 6: Add in the haddock-infused milk, bay leaves and white wine. Season with salt and pepper if needed. Set aside and allow to cool. Step 1: Bring a large pan of salted water to a boil. Step 2: Once the water is boiling, add your potatoes and cook for approximately 12 minutes until the potatoes are soft. Stick a fork in the potatoes to check. Step 3: Remove instantly and drain the water. Leave the potatoes to air dry for 10 minutes before mashing them with a potato ricer to get a smooth finish. Step 4: Add the cream, butter, and nutmeg, and keep warm in pot with a lid on low heat. Step 1: Add the milk and eggs and whisk together. Step 2: Dip each claw individually into the flour, then into the egg mix, and finally into the breadcrumbs. Step 3: Heat fryer to 180C (350F) and fry crab claws until golden brown just before serving. 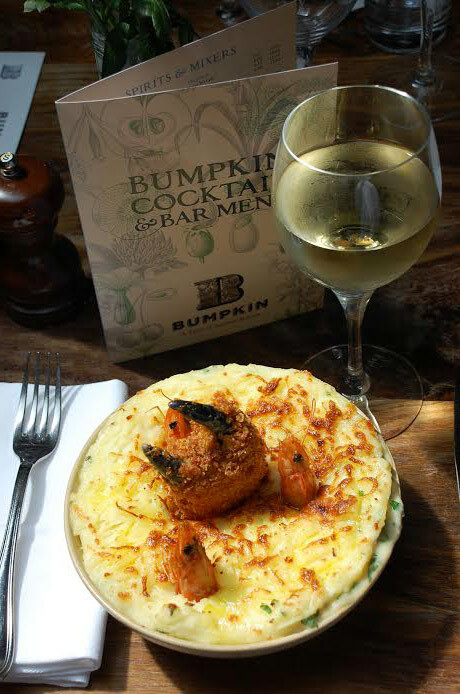 Step 1: To build your fish pie, divide the smoked salmon, fresh salmon, prawns and haddock evenly between each dish. Step 2: Then top each pie with sauce. Step 3: Then divide the diced eggs, peas and samphire evenly between each dish. Step 4: Next top each pie with mashed potatoes. Sprinkle each with parsley, then grated cheese and cook in oven at 180C (350F) for 15-20 minutes, or until golden brown. Step 5: Top with two fried crab claws in each pie.